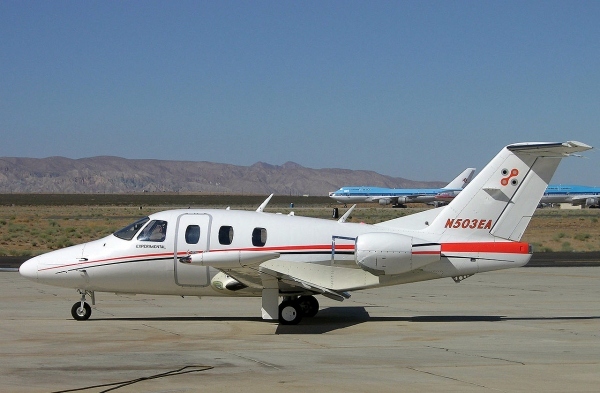 The EA-500 Aircraft is the Eclipse 500 Very Light Jet. EA-500 is the official model name for the Eclipse 500. EA-500 is the official name of the Eclipse 500 for ICAO and government regulators, like the FAA. For more information on the Eclipse EA-500 jet visit the other Eclipse 500 page listed below. Above Eclipse EA-500 photo by Alan Radecki on Wikimedia Commons. Photo released under a Creative Commons License. EA-500 Price - Information on the pricing of the EA-500 aircraft. EA-500 For Sale - Learn about Eclipse EA-500s for sale. EA-500 Problems - Read about some of the problems the EA-500 had in the past. EA-500 Training - Get the details on training programs for the Eclipse EA-500 very light jet. EA-500 Specifications - Get the full specifications on the EA-500 aircraft. EA-500 Performance - Learn about the EA-500 Performance in detail. EA-500 Range - Find out about the Range of the EA-500. AvioNG - Learn about the AvioNG avionics for the EA-500 jet. EA-500 Operating Cost - Information on the operating costs for the EA-500 jet. EA-500 Type Rating - Find out about the type rating courses for the jet. EA-500 Cockpit - Take a look at the EA-500's cockpit. EA-500 Engine - PW610F-A - Learn about the engine that powers the EA-500. EA-500 Interior - Cabin - Learn more about the interior of the EA-500 airplane. EA-500 Simulator - Get information on the available EA-500 simulators. EA-500 Dimensions - Information on the dimensions of the EA-500. EA-500 Fuel Burn - Learn how much fuel the EA-500 burns in flight. EA-500 LX Edition - Find out about the EA-500 LX edition and learn about the features it has.